Chobe is easy to get to, and you don't have to look far to see all sorts of animals and get a good taste of what the rest of Botswana has to offer in a very short space of time. Chobe is best known for its elephants and although hard to estimate, it is thought there are between 45,000 and 90,000 elephants in the Chobe region. This is the greatest concentration of elephants on the planet. Notwithstanding these entertaining giants, Chobe has some of the finest game viewing in all Africa and can get quite busy at times. A more romantic and less frequented alternative to Chobe is the adjacent private reserve of Linyanti or the unique terrain of Savuti. 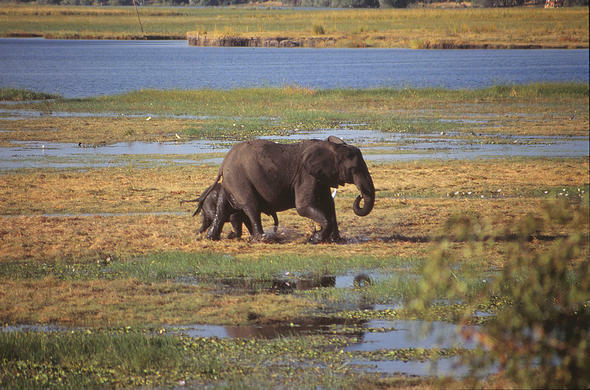 Unlike Chobe National Park they allow off-road, night driving and accompanied game walks.The wide Chobe River is the lifeblood of the area and feeds adjacent flood plains much loved by the Elephant. They often swim across the river to graze on the lush squelchy grass plains during the day, and swim back to the Chobe National Park in the afternoon. Seeing only the tip of an Elephant trunk as it paddles underwater, then watching this enormous animals emerge from the river, is a wonderful sight.There is always something amazing to look at while cruising up and down the Chobe River including plenty of vociferous Hippo, silent beady-eyed Crocodile and the soaring Fish Eagle crying out the distinctive sound of Africa. Each evening Chobe provides its nightly spectacle of a classic red globe sunset sinking slowly into the mercury surface of the Chobe River. Make sure you have your camera at this time of day, as every sunset photo is a stunner!The Chobe River is Botswana's northern boundary with Namibia and just to confuse you, this river changes its name 4 times after entering Botswana from Angola in the north. It enters as the Kwando, then becomes the Linyanti, then for a short while is called Itenge, and is finally known as the Chobe. This great river then encounters the stately Zambezi, and together they head off at a fast pace towards Victoria Falls. The magnificent Victoria Falls is only a 2 hour drive from Chobe and cannot be left out of a visit to this region.This far north-eastern corner of Botswana is famous for being the only place in Africa where 4 countries meet: Botswana, Namibia, Zambia and Zimbabwe. This makes it easy to head off in any direction for a complete safari experience encompassing several different countries and all the best sights. The small dusty town of Kasane in Botswana has become the busy safari entry and exit point of the region. It has numerous riverbank or hillside safari lodges, all of which have easy access to Chobe National Park and Chobe River as well as all the other attractions nearby.